Dwight David “Ike” Eisenhower was the Supreme Commander of Allied Forces in Europe during World War II, General of the Army (5 stars) at the time of Germany’s surrender, President of Columbia University and the 34th President of the United States. The policies of his administration during his two terms in office resulted in a continued rise in postwar prosperity in America. It was Eisenhower’s appointment to West Point in 1911 that laid the foundation for the illustrious military and political career that lay ahead of him. His 1915 graduating class would later be called “the class the stars fell on” because 59 of its members eventually became generals. 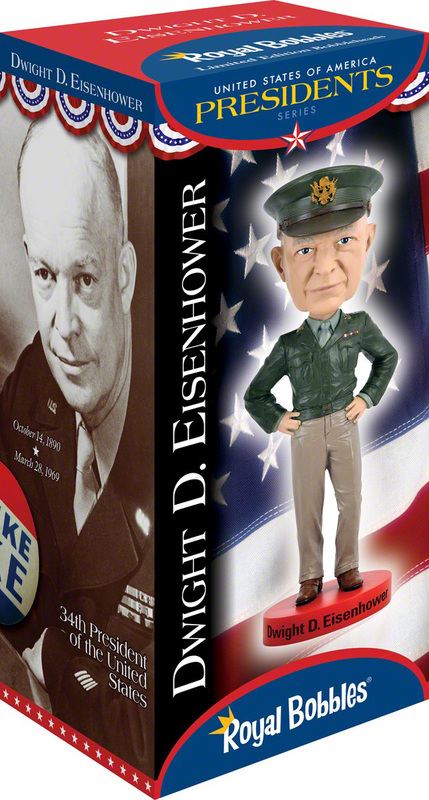 This is version 2 of the popular Dwight D. Eisenhower bobblehead that was updated in 2016 with improved features.